This simple, multi-purpose pair of sneakers can serve several needs. From training at the gym, to running miles, or playing basketball at the court, this pair of sneakers has got you covered. Made from high quality synthetic material, every inch of these sneakers is designed to provide comfort. 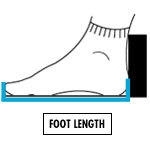 The insoles feature breathable fabric that are soft and also help with perspiration on your feet. The outsoles provide a sturdy base, giving you the confidence you need for all of your activities. It also provides years of durable use, without damage. Because these shoes are light weight, they are just perfect for casual wear. You can easily pair these sneakers with denim, khaki or corduroy. You can also wear them with denim shorts for an edgy look. The unique design and build will definitely make you the cynosure of all eyes while your feet do all the talking. They're perfect for all casual and sporting occassions. The shoe runs small. Please chose a size bigger than your normal size.